Online platforms are responsible for their users’ activity and are susceptible to experience fraud. Substantially reduce any risk thanks to our prevention tools and in-house fraud engine. Benefit from a fraud liability shift back to the issuing bank on successful 3DS authentications. Choose to force 3DS on transactions that you deem risky based on users' behaviour. Guarantee a trustworthy payment environment which will contribute to the increase of your conversion rate. Use our versatile tools to build an anti-fraud strategy which fits your workflow with customised rules. Spot and flag any unusual behaviour thanks to the unique identifier which we attach to every card used on your platform. Force 3DS or allow U.K., U.S.A, and Canadian transactions based on the AVS score comparing billing information with the user's bank data. Make use of our e-wallet technology to ensure that funds are secured at each step of the payment flow. We have developed an in-house fraud engine to notify you and take action against suspicious behaviour. Thorough verification of your users' identity in compliance with European regulation. Find out more about this process here. Reliable detection of stolen cards thanks to daily updates of our fraud engine data. Efficient identification and prevention of payments from high-risk countries where fraud and the financing of illegal activities are common. 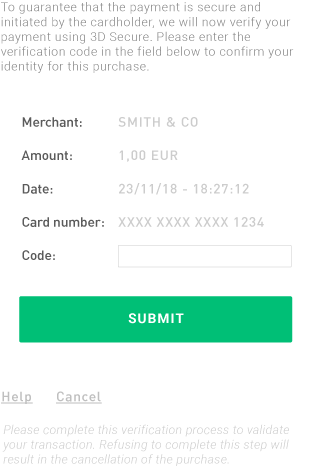 Automatic capping of transactions by card over a 24 hour period. You can adjust this by contacting us. Easy CVC collection to facilitate the issuing bank's security requests and verify the physical presence of the user's card. Discover our best practices to set up the ideal safety net on your platform. 3DS is supported globally. It is up to the banks which issue the cards to decide whether to include it in their system. What is the trigger for 3DS? Is it possible to modify it? Payments which exceed €50 will automatically trigger 3D Secure. It is possible to either lower or increase it. How can you efficiently fight against fraud? Efficiently fight fraud by creating a fraud strategy based on your preferences, read our full recommendations here.